Freeplane is an off-shoot ( a ‘fork’ on software terms) of FreeMind. After a long period of working together to produce a great free mind mapping application, differences of view arose amongst the developers and Freeplane was born. It has since developed in a different way to FreeMind and is at present showing more activity, though FreeMind development continues. Personally I prefer Freeplane and now use it in preference to FreeMind, I have this flagged as a “Fave” for that reason. But the differences are not great and I suggest anyone considering either should try both. My experience so far is that Freeplane can open FreeMind (.mm) files and vice versa, though I have not done any stress testing and as this is an independent fork of FreeMind, there can be no guarantee that this will always be so. This is flagged as a “Fave” because I use it from time to time, and appreciate the continued development. It is even better now. Version 1.5.10 has been released as stable. The developers are as active as they are talented. Lots of new features. easier to use and more powerful + fast and nimble. I use it more than any other program. I want to use a mindmap to graphically represent types of data. It would be great if I could export to html, with collapsed nodes with the option of the viewer being able to expand the nodes. I am currently using Cmaps. Any ideas will be greatly appreciated! I don’t think the free student version can do this type of export, but you could check. 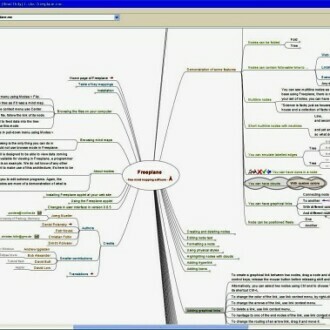 “If you are using Freemind or Freeplane 1.1, visit freeplane.org and download Freeplane 1.2 beta to get a new user experience in mind mapping. Freeplane 1.2 has outgrown these previous programs to a large degree. Freeplane 1.2 is much more versatile, has many new and improved functions and a revised menu structure which is more intuitive for the beginner. The documentation has been improved and consists of a Quick reference and Documentation as part of the program and a wiki Tutorial Freeplane with didactic examples, computer based instruction and a growing examples in the mind map gallery. Freeplane 1.2 is going to be the heart of an academic literature suite. Besides Freeplane 1.2 fully supports Groovy scripting, so you could extend the program yourself – if the abundant functionality should not fit your needs already. read more on http://www.freeplane.org. it exist a book in French “Boostez votre efficacité avec Freemind, Freeplane et Xmind” éditions Eyrolles Pierre Mongin et Xavier Delengaigne. 2iéme édition.http://www.amazon.fr/Booster-votre-efficacit%C3%A9-FreeMind-Freeplane/dp/2212126964/ref=pd_sim_b_4 It explains with 11 studycases how these software of mind mapping can be used efficiently. The site http://www.mindmanagement.org have many posts about it . Freeplane is very used in the French schools. I enjoy the built-in and customizable function-key keyboard shortcuts (with 5 sets, using shift, ctrl, alt, and shift-ctrl to bring up four of them) and the HTML-capable node and note editor, comprehensive search tools, and the attributes feature, which allows cross-linking-style capabilities as well as scheduling, to-do lists, and project management to be accomplished. (Freemind just added attributes to their 0.9.0 version as well). The export functions have worked better for me in Freeplane than in Freemind, but that is ongoing in the improvements to both. Also, I like the look of the toolbar better! It seems more “fun” to use, somehow. (I used Freemind for two years before discovering Freeplane). I use version 1.1.3 of Freeplane at the time of this writing. As a Freemind user of three years I was delighted with the various little upgrades in Freeplane. Well worth the move. Mind maps are more presentable in terms of appearance. Thanks for sharing your experience with Freeplane Erik. Yes, this one is a great tool. easy handling even for beginner.